Studying translation I was fortunate enough to be part of a very multicultural group. There were a lot of social gatherings, most of them spontaneous, and a few meticulously planned by our study group secretary. Close to Christmas holiday one year, we were assigned a very special task, cook something from our home country. And out came her suggestion for us Greeks: why don’t you make dolmadakia? it’s great finger food! You should have seen our faces. Pale as sheets, unable to utter a word. Make dolmadakia? 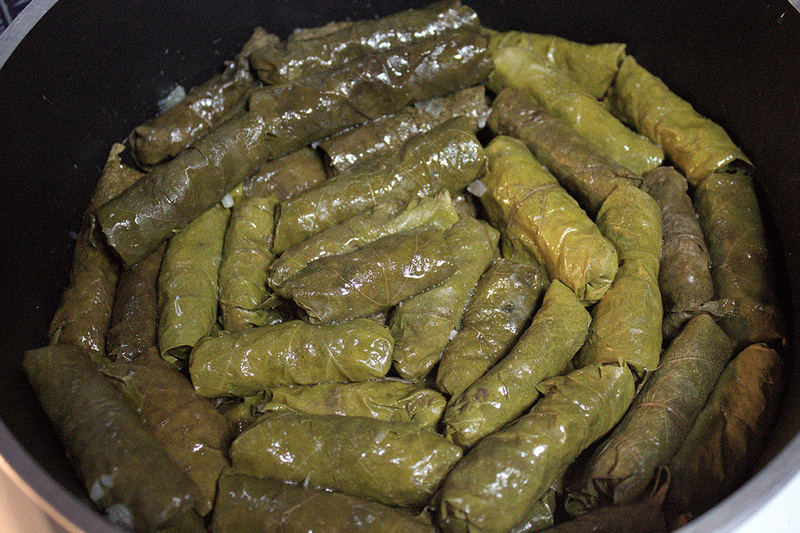 There was no pot big enough on the entire campus… Vine leaves! Where on earth are we going to find those? Is she mad? Does she know how long they take to prepare? Doesn’t she realise students survive by grazing off raw salads or eating burgers? You need grandma love for dolmadakia , it’s a special ingredient. The thoughts burst like bubbles above our puzzled faces. Well, we eventually found the courage to say no. We prepared Greek salad and spinach pie instead. This time dolmadakia was the inspiration of my sister and brother in law. They were talking about it in bed. This is how much we love our food, we take it to bed! Optional: If you like dolmadakia meaty add some beef mince instead of rice in your filling. 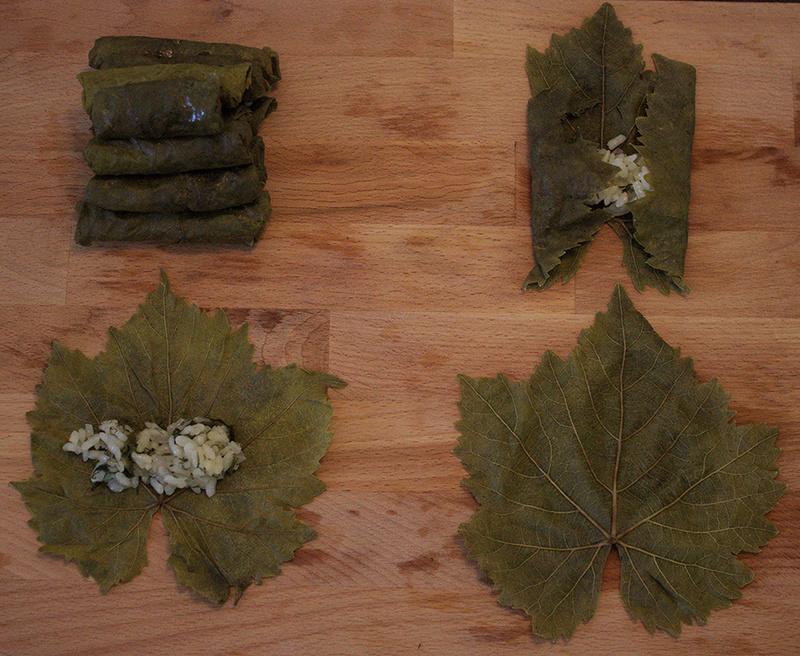 If you are lucky enough to find fresh vine leaves you will need to blanch them in salted water for a couple of minutes. Once ready, remove from the pot and place in a bowl of cold water. Then you need to remove the very thick stems and veins. 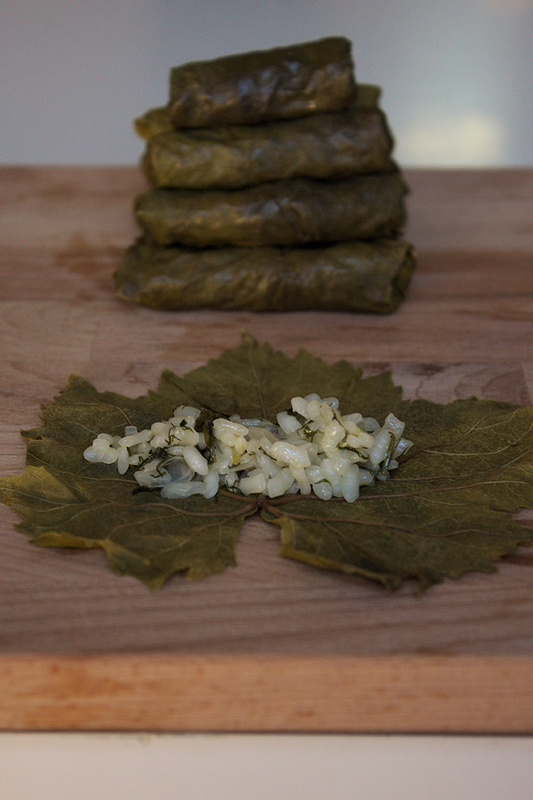 If your vine leaves come from a jar, place in a strainer and rinse very well before using. Gather your ingredients together and sauté your onion and spring onion. 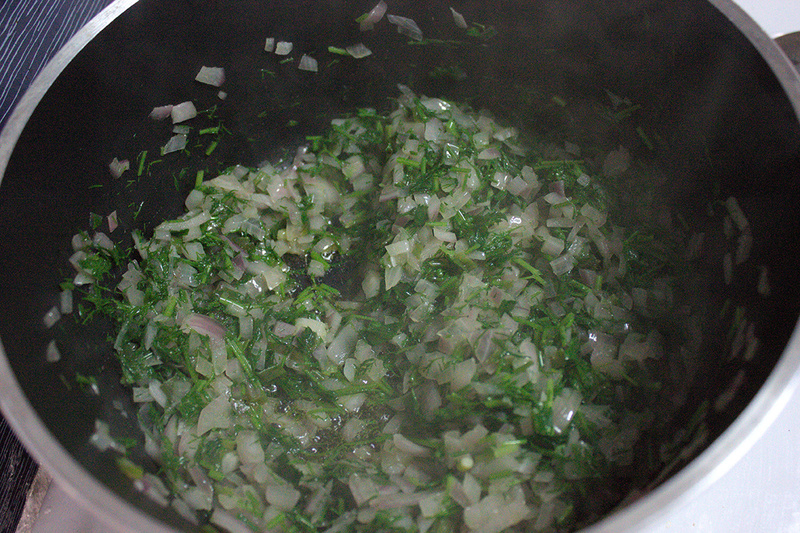 Add the herbs and in a couple of minutes stir in your rice. Add to this mix 1 mug of water and let it boil for a few minutes, 4-5 minutes should be fine. Remove from the heat, cover with a clean towel and let it stand for an extra 10 min. 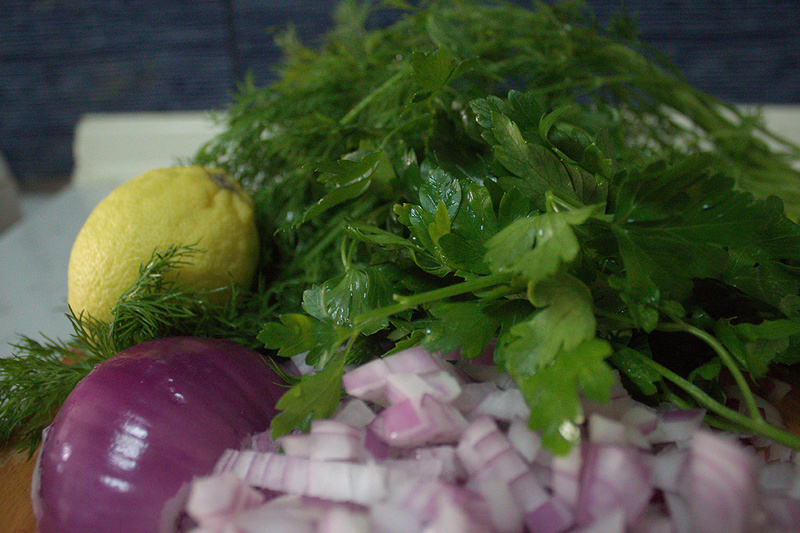 Once ready, mix the rice and onions with the herbs, add salt and pepper. You are ready to start stuffing! Keep the few torn vine leaves aside as you will need those to cover the bottom of your pot. Now this is a slightly tedious part, make sure you have some music on and possibly an extra pair of hands. You need to open each leaf with veined surface facing you. Place a teaspoon of rice on the base of the leaf, fold in the sides and then roll tight. The thinner the dolmadaki the more obvious the artistry of the cook. Aim for a tight and tidy roll. It’s a little bit like making sushi maki. Once it’s all rolled, place a few leaves in the bottom of your pot and lay the ntolmadakia around in circles. Fill in the pot with water and lemon juice until the dolmadakia are covered. And then the plate on top! Don’t forget it or you will have a very messy pot. Boil in medium heat for 30-40 minutes. Et voila! They are perfect as a snack with a bit of garlic yogurt sauce. Enjoy!